Quantifying the Movement: 40 Questions, 20 Minutes, 1 Life Changing Report. The assessment tools will examine 4 dimensions of an individuals baseline perceptions on diversity issues. The 40 question assessment will take about 20 minutes and it will generate a 20 page detailed report that can be used as a goal setting tool, Self Knowledge indicator and behavior development outline. You have employees that are making remarks that are questionable at best. Your Human resource team need measurable actionable tool to prepare the workforce for the changing demographics. Leadership is asking you for benchmarks for diversity and inclusion attitudes. We have a tool that you can use as a benchmarking tool. This tool uses 4 focus areas to create outlines for individual and group action plans. Order your 20 page report and action plan today. 40 Questions, 20 minutes, 1 report and a lifetime of learning. 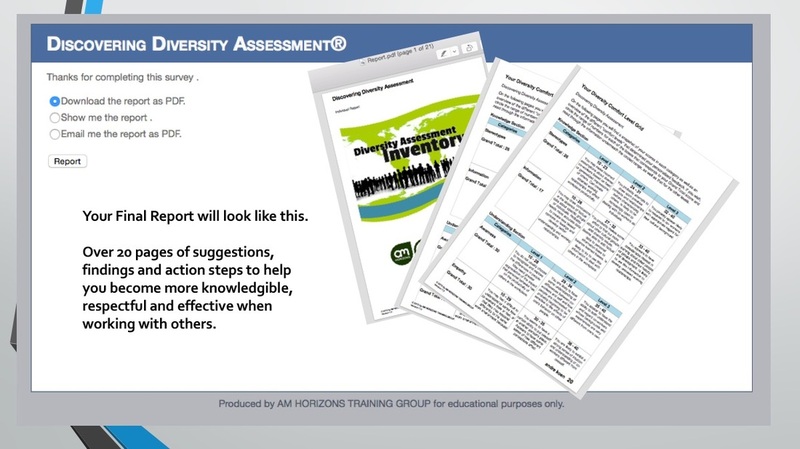 This Diversity assessment should be used for informational and educational purposes only. The assessment will take about 20 minutes and it will generate a report that can be used as a goal setting and behavior development outline.